Artillery Kaserne buildings in Garmisch, Germany, have been extensively modified during the past 73 years. But one feature still remains – hundreds of iron rings used to secure pack animals decades ago. Photo by John Reese. GARMISCH, Germany — Artillery Kaserne in Garmisch dates back to a groundbreaking ceremony September 25, 1935, when it was first established for the Wehrmacht. Since then, the buildings have been extensively modified to install and upgrade offices, shops, and warehouses. Yet a feature remains that frequently generates curiosity – hundreds of iron rings on the walls of the buildings. The rings are waist high and evenly spaced, about the distance of a person with arms extended, from each other. Other than one eagle statue adorning the corner entrance of one building, the Spartan aesthetics of the original kaserne are proof that the German army of the 1930’s had little interest in decorating buildings. The statue was removed later due to the questionable past of Krafft von Dellmensingen and the name of that part of the kaserne retired. So why the rings? On October 1, 1936, Mountain Regiment 99 and 4th Battery, Mountain Artillery Regiment 69 were transferred to the new kaserne and renamed the Gebirgsartillerie Regiment 79. In 1937 the kaserne was named Krafft von Dellmensingen to honor the creator of the elite Deutsche Alpenkorps. Born in 1862, General von Dellmensingen had combined snow shoe battalions together in May, 1915 to form the mountain corps. A highly decorated general, he served in World War I, commanding the 2nd Bavarian Corps during the last spring offensive and the final defensive battles of 1918. 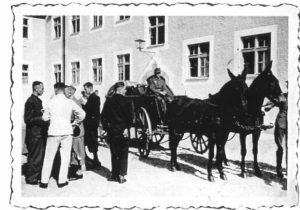 Mule wagons were a common sight on what was called Krafft von Dellmensingen Kaserne in 1937. He lived to see the kaserne named for him and the battles of World War II before passing away in 1953. His legacy, the mountain jäger (Gebirgsjäger), brought thousands of horses and mules with them to Garmisch. To accommodate these pack animals, thousands of hitching ports were built into the interior and exterior walls of KvD Kaserne. At the outbreak of World War II, the German army was essentially still a horse or mule-drawn combat force. Hundreds of thousands of pack animals were used by Germany throughout the war, and the sure-footed mules were reliable transportation for dangerous mountain duty. Because of the war, KvD was not realized for its intended use as the headquarters for the First Mountain Division, instead serving out the war as reserve and training center, an army hospital, and a rehabilitation station for wounded soldiers. After the war, and under the U.S. Army it continued as a hospital, POW camp, and refugee housing area. The arrival of the motorized Americans in 1945 ended the pack animal era at KvD, so much so that in 1957 the kaserne became a U.S. Army vehicle repair facility, reclaiming and refinishing vehicles from across Europe for the U.S. and NATO allies. A survey about 10 years ago counted 454 surviving external ring ports visible on post. 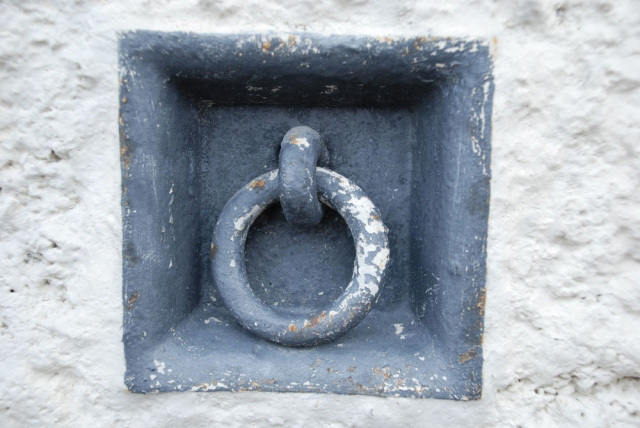 There are more rings and ports hidden by modern machinery, storage additions, plastered over, and inside of buildings used for shops or storage. Building 202 with shops below and offices above, has 102 external rings, the most of any building on post despite the addition of many large bay doors and other significant modifications. The combined PX/commissary complex comes in second with 100 rings. The kaserne post office has 38 rings remaining between walls of glass blocks. One externally unmodified building in the back of the kaserne offers the best evidence of how many horses and mules could be tied outside of a single standard building with an evenly spaced 64 rings. Assuming an identical number indoors, each building could hitch about 128 animals. Curiously, the garrison headquarters building, once a stable according to a plaque inside, has no surviving rings. The last reported use of the rings for their original purpose was supposedly by mounted Polizei on occasional visits to post in the 1960s, possibly as late as the early 1970s. The closest usage today is an occasional bicycle hitched to a ring instead of a bike rack. In 1975, 30 years after the end of the war, the First Mountain Division finally moved their headquarters to Krafft von Dellmensingen Kaserne, sans horses and mules, staying until 1990 before shifting south across the Loisach River to Sheridan Kaserne; four years later they left Garmisch for good as part of a Bundeswehr realignment, moving north to Munich. Not long afterwards the post became known simply as Artillery Kaserne. Today the soldiers of the Gebirgsmusikkorps, the First Mountain Division’s band, are the only remaining German troops. The only evidence to be seen of the thousands of pack animals now are the hitching rings. Horses and mules are not standard issue any more, although the U.S. Army currently employs some for ceremonial use and in the mountains of Afghanistan. Scenic carriage rides and a few grazing horses in the fields south of the garrison are the only other signs of what was once the primary means of military and civilian transportation in the shadows of Germany’s highest peaks. The last time horses were seen on Artillery Kaserne was for sleigh rides at the Christmas tree lighting ceremony in former years. No word on the mules.